The Atlantic Path connects Andrews Woods, via a number of public footpaths, to shore and recreation areas to the north and the south (see area map). 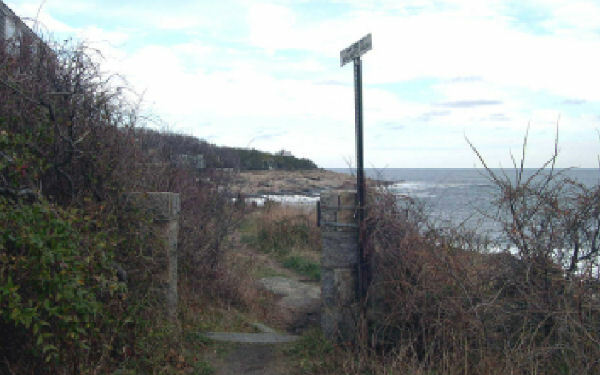 Hikers, bird watchers, and ocean strollers use the Atlantic Path to make Andrews Woods a part of extended explorations of the rocky tip of Cape Ann. The Massachusetts Heritage Landscape Inventory Program describes the Atlantic Path this way: "In Rockport, as in many of Essex County's coastal communities, access to the ocean is highly valued. Rockport has an active Rights-of-Way committee that has worked over the past decade to document public paths and town landings. Some of these date to the 17th century and permit access to the intertidal zone only for "fishing, fowling and navigation" while others are historic boat landings and still others cross private land and grant only the right to "pass and repass." Other coastal areas owned outright by the town include public beaches, wharves, parks and conservation land. One of the most popular coastal areas is Atlantic Path, which extends north from Cathedral Avenue in Pigeon Cove to Halibut Point Reservation. A section of pathway near Thornwood Avenue is private and no longer shared as part of the path. This precedent is a serious concern to Rockport residents who fear that access to the path may become more limited as the scale and density of development increases along the coastline. Andrews Point, located along Atlantic Path at the end of Point De Chene Avenue, is one of the most popular coastal spots in Rockport, known for its scenic value and as a bird watching area. Only a small section of Andrews Point is open to public access and parking is limited."